What do you do if your HDMI display is rated as a Full High Def (FHD) 1080p resolution, 1920*1080 pixels capable monitor, yet your signal is only 720p? How do you find the extra pixels to fill your display completely with a FHD image? Well, it is easy. 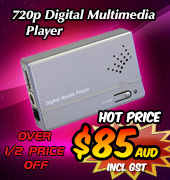 Simply use our HDMI Video Scaler ID#546 to take Standard Def (SD) 480p/480i and 576p/576i and HD 720p HDMI signals and up-convert all to Full High Def 1080p and 1080i video for big screen TV viewing. 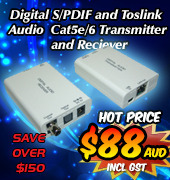 Realise the true value of your digital equipment by using this accessory. Not only will our HDMI Video Scaler ID#546 upscale video signals, it will also work the other way by down-scaling the signal to a SD resolution, so that you can watch FHD video on any HDMI SD screen or monitor. 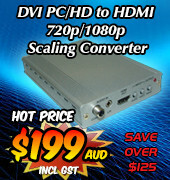 The "HDMI Video Scaler", on power-up, automatically detects the connected displays characteristics and outputs to suit that particular displays capabilities. Once the HDMI Video Scaler ID#546 establishes connection you can access the converters in-built OSD menu to further enhance the way the picture is displayed. The usual adjustments for colour, brightness, contrast and finetuning are there, as well as image size control for full, over-scan and under-scan to take advantage of irregular size screens. All of the available resolutions from SD 480 & 576i/p right up to FHD 1080i/p are listed in the OSD menu. Simply highlight the timing you want to select by using the soft-touch buttons mounted on the front panel. 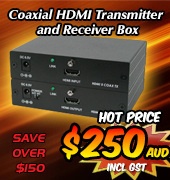 Click the 'enter' button and the HDMI Video Scaler ID#564 automatically converts to the new timing. If any problems occur, simply reset all to the factory default settings and start again. A video's audio track is normally carried through to your HDTV via HDMI cable, but you may elect to output the signal to an external Sound System via either digital TOSlink, or by Analog 3.5mm phone-jack (for headphones). Again, simply plug in the appropriate audio leads for the system type you want and adjust the volume as required. This versatile, high quality HDMI Video Scaler ID#564 will make viewing your favourite videos that much better by upgrading the video signal to a resolution that will best suit your HDTV and by transferring the audio track to a superior sound reproduction system. This gives a total overall lift in the video and audio quality for a superior viewing and listening experience. To learn more about this product, simply use the HDMI Video Scaler ID#564 links posted across this story to access the products webpage. You may read more about the product's Features and Specifications, download the free User Manual, or order and make payment all in 3 easy steps.